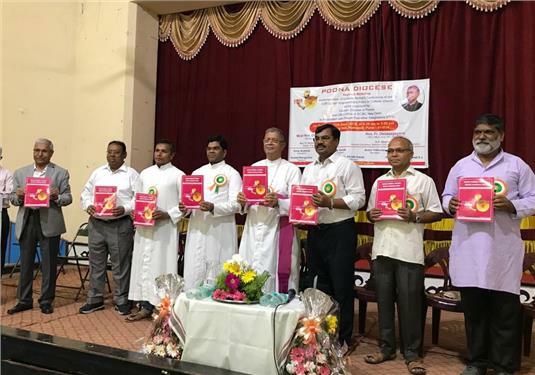 The CBCI Dalit Empowerment Policy in Marathi language was released by Most Rev. Thomas Dabre at Pontifical Seminary, Poona on 11th September 2018. The one day workshop was jointly organised by CBCI Office for SC/BC, Poona Diocese, and Pragat Padvidhar Sanghtana to discuss about the implementation of CBC Dalit Empowerment Policy. Around 100 people from Pune, Aurangabad and Nashik dioceses participated in the program. Releasing the DEP in Marathi, Bishop Dabre promised that he will be 100 percent with CBCI, in implementing the Policy. Fr. Bhausaheb Sansare SJ the Rector of the Papal seminary insisted that the Dalit Christians should involve themselves in the civil society especially in politics. He also said that the educated people from the Dalit Christian community who are settled in urban areas should not distance themselves from the rest of their community who are poor and living in rural areas. He said that they should guide them to come up in life. Fr. Devasagayaraj, secretary to the CBCI Office for SC/BC explained the process by which the Dalit Policy was evolved. He said that the purpose of the Dalit Policy is to create an equitable Church in India. Dr. Patole explained the Policy in Marathi. Dr. Wagmare the Secretary General of National Council of Churches (NCDC) shared with the participants the issue of the Scheduled Caste status to Dalit Christians and our duty to demand the same from the Government. The Pragat Padvidhar Sanghtana an organisation of Dalit Christian graduates was started 49 years back by the people who were guided and helped by late Fr. Mathew R. Lederlie SJ, former provincial of Poona- Goa province. The Purpose Pragat Padvidhar Sanghtana is to guide and help the Dalit Christians to come up in life as its members were helped by a missionary. The Poona diocese will come out with action plans for the Empowerment of Dalits, based on the suggestions that came from the participants after getting the official approval from the bishop.